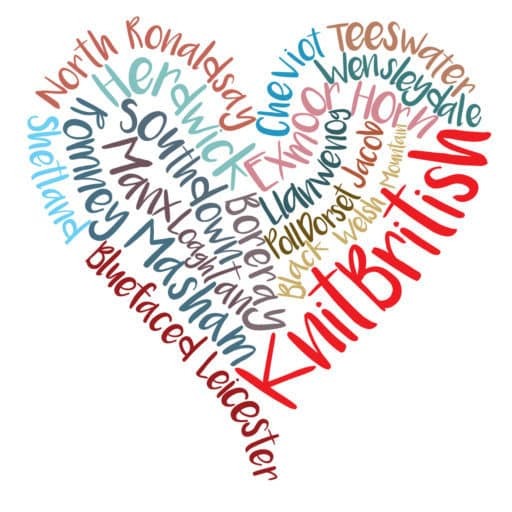 If you have been following me, Shiny Bee’s Jo, Knit Spin Cake’s Aimee or Caithness Craft Collective’s Louise Hunt then you will be aware that we are all of buzz about organising a KAL to knit Tin Can Knit’s Lush cardigan. Listeners and readers of KnitBritish will know that it is not that long since I finished my own Lush, knit in Brigantia, and that I really wanted to knit another one. After chatter on twitter with my favourite podcasting chums we thought we could start up a little Lush-along. The chatter got around and we seem to have got a lot of people interested in joining us and so if this is a pattern you have always wanted to knit then why don’t you join up too? Lush is knit in DK and is a paid for pattern, which is available as a single pattern or in the Handmade in the UK e/book (which is a fantastic collection of lace patterns all knit in British wool!). 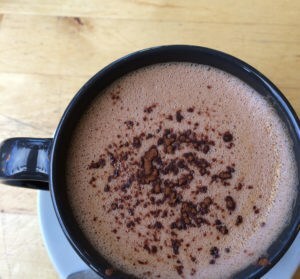 If you haven’t knit a Tin Can Knits pattern before then, doubtlessly, you will have heard me tell you that patterns are really well written, easy to understand and set out beautifully. 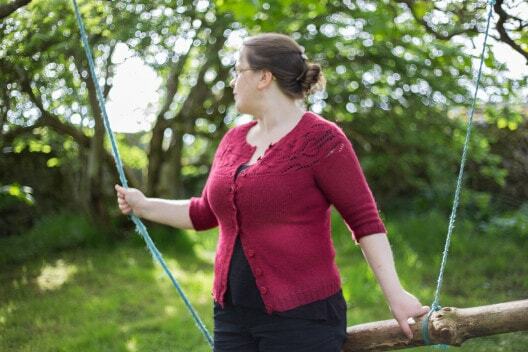 The sizes start from baby to Adult 4XL – which is perfect as we already have had people say that they desperately want to join in but might not have time to knit an adult size – if you don’t have a wee person in the family, you could donate one to charity! The gauge is 20 sts/26 rows in stockinette on 4mm needles and the cardi is designed to be close fitting with -1 to -3 negative ease. Cast on date is Sunday 20th July – this Sunday! – and we are knitting for 8 weeks with FOs by 14th September. You need to sign up in my thread over at the KnitBritish ravelry group – when you post there tell us which yarn you are going to use too. When you do cast on then share your project with the Shiny Bees’ group, Knit.Spin.Cake. group, Caithness Craft group and the KnitBritish group, so we can see your progress. Tag your project with Lush-Pod-KAL and if you are tweeting use #LushpodKAL. 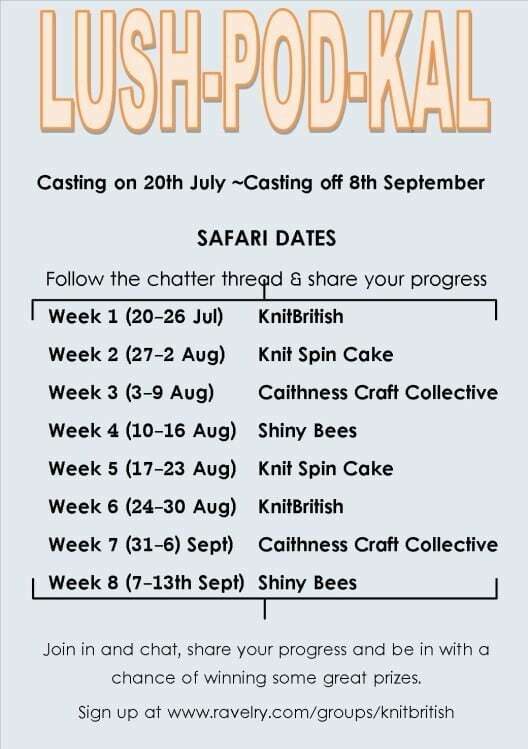 There will be chatter threads in each group, but with a bit of a difference – Jo, Aimee, Louise H and I will be be taking the KAL on safari to our blogs, podcasts and groups and so the chatter will do that too. When the safari is with one of us, the other chatter threads will be locked. This way we all go on tour together! Jo describes it as a bit of a treasure hunt – and when you see the prizes attached to the chatter threads then you are going to want to join in, for sure! 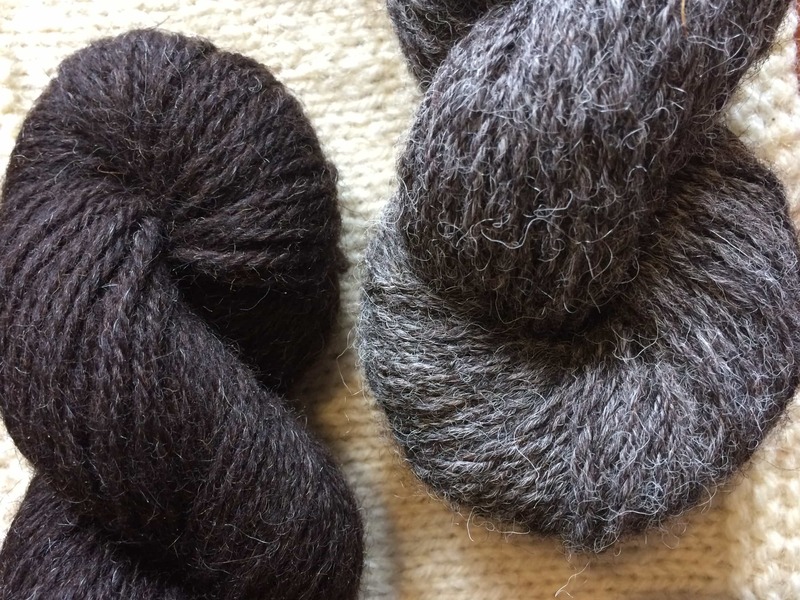 We have rustled up fantastic prizes for lucky KAL winners – including British yarns, luxury yarn, project bags – and we have some amazing Blacker Elegance Falkland Corriedale/Alpaca yarn prizes too. We are working out how to split the prize pile and will announce the prizes in due course, but you must be at least 75% through your project by 14th September to qualify for the prize draw. In addition to our prizes, Emily and Alexa from Tin Can Knits have offered EACH PODCASTER a set of prizes for 3 lucky winners in each chatter group. The prizes for each of the four groups are one TCK ebook of the winner’s choice from their current pattern collections* and 2 prizes of a single pattern of the winner’s choice. How spectacular is that? 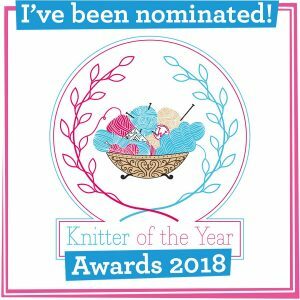 Make sure you follow the safari and chatter in each of the groups to better you chances of winning and thank you so much to Tin Can Knits for providing a really fantastic prize. Blacker are offering a 10% discount on their Blacker Swan Falkland Merino DK – get your orders in fast! Anyone choosing Blacker Swan for the #LushPodKAL will receive a 10% discount for the duration of the KAL. Just enter the code LUSHKAL5634 as you check out! And if you that doesn’t tempt you, you can head over to the signup thread to get inspiration from other knitters. We are really delighted to be hosting this KAL and really looking forward to a fun knitalong. either 9 Months of Knitting, Great White North, Pacific Knits or Handmade in the UK.